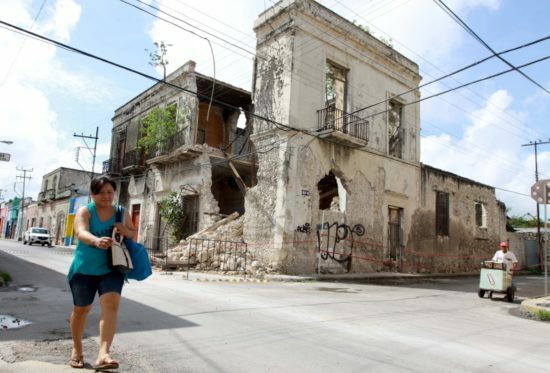 Mayor Mauricio Vila Dosal warned that there are six houses in Merida’s Centro at risk of collapse due to the serious deterioration caused by more than 20 years of abandonment. He also said that he has already reiterated a request to the National Institute of Anthropology and History (INAH) in Yucatan to authorize the demolition of these properties, as they are a risk for people who need to walk next to the houses or buildings that are about to collapse each rainy season. Vila Dosal pointed out that the partial collapse of the old houses is a risk to the citizens. The buildings easily have more than 20 years of abandonment and now is the right time to solve once and for all this danger because each year the condition of these properties worsens. The director of the Civil Protection Unit of the State of Yucatan (Procivy), Aaron Palomo Euán, offered to collaborate with the municipal Civil Protection Directorate to prevent a tragedy from possible collapse. The official stressed the work should be done by the City in addressing this type of incident. Several sections of an old house on the corner of 65th Street with 44th Street of the Center collapsed due to the accumulated humidity from recent rains and deterioration of the building. Part of the facade fell, along with a significant portion of the ground floor ceiling and a section of the second floor of the building. Owners had previously been warned of the risk represented by its poor condition. “In previous occasions we have worked and the state government is in the best disposition to offer all the support and advice, he reiterated. Often, the review of collapshing homes is hampered because most are abandoned and the owners do not appear or do not have sufficient resources to restore them, he added. The official recommended not to approach these properties or to place any signs of danger, especially during rainy seasons.